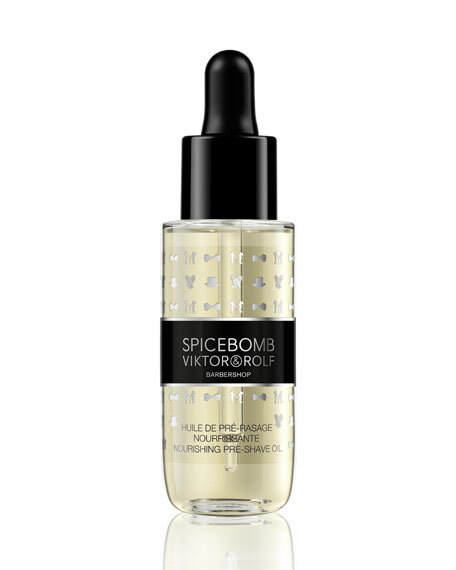 Viktor & Rolf Spicebomb Pre-Shave Oil, 1.0 oz. Viktor & RolfSpicebomb Pre-Shave Oil, 1.0 oz. The first step towards the ultimate shave experience. The Nourishing Pre-Shave Oil softens the beard and prepares the skin for a close and comfortable shave, without leaving an oily residue. It is formulated with a unique blend of botanical oils and suitable for all beard types. This must-have oil can be used for both shaving prep and beard conditioning, leaving your skin nourished and moisturized for the perfect shave.